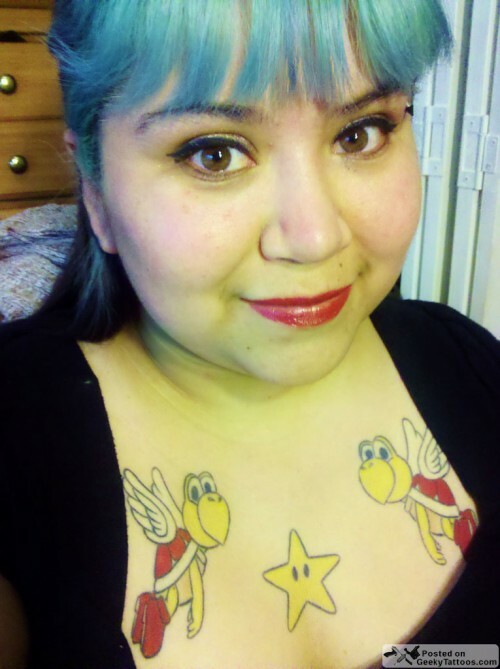 Remember Ashley’s Blanka tattoo? Well she’s back, and this time she’s bringing her Paratroopas with her! She says she wanted to get something to represent her husband going into the Navy but didn’t want your typical sparrows or other sea-going tattoos. Since her husband is a gamer, she got the paratroopas and the invincibility star. Tagged with chest, paratroopas, star, Super Mario Brothers.